Hazelnuts and chocolate combine in these decadent Nutella bars. A crispy cereal crust is topped with a layer of rich Nutella and chocolate, studded with hazelnuts and scented with orange zest. 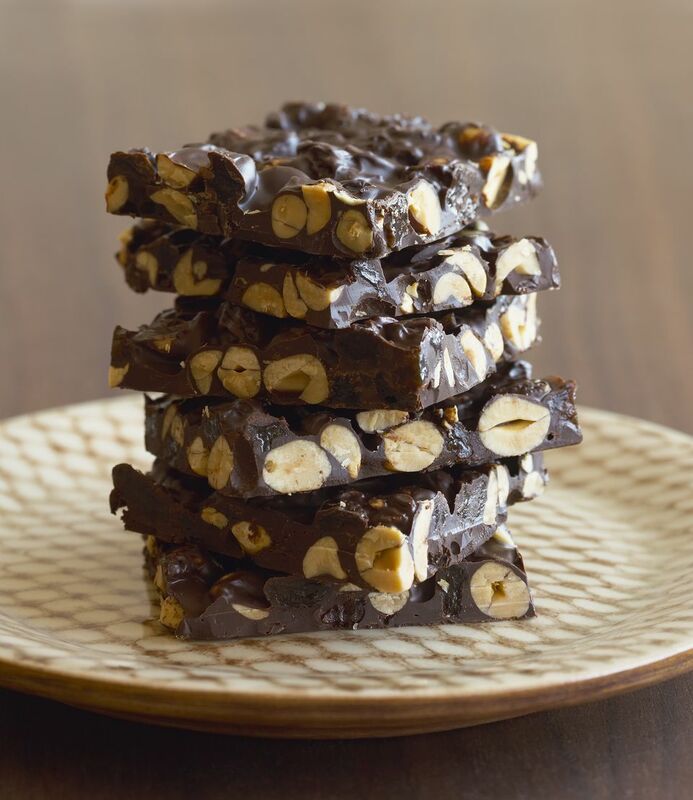 A glossy chocolate icing completes these gourmet bar candies. 2. First, prepare the crispy crust. Place the cereal in a large heat-safe bowl and set aside. Place ¼ cup water, ¼ cup granulated sugar, and 3 tablespoons of corn syrup in a very small saucepan over medium-high heat. Stir the mixture until the sugar dissolves, then brush down the sides of the pan with a wet pastry brush to prevent sugar crystals from forming. Insert a candy thermometer and continue to cook the mixture, without stirring, until it reaches 240 degrees on the thermometer. 3. Once the sugar syrup reaches the proper temperature, remove it from the heat and stir in 3 tablespoons of butter until it melts. Pour the mixture over the cereal and stir until it is combined. Quickly scrape the cereal into the prepared pan and press it into an even layer. 4. Next, make the chocolate-Nutella layer. Place 1 cup of semi-sweet chocolate chips or chopped chocolate in a large microwave-safe bowl and microwave until melted, stirring after every 45 seconds to prevent overheating. Stir the chocolate until it is melted and smooth. 5. Add the Nutella, chopped hazelnuts, and orange zest to the melted chocolate, and stir until smooth and well-combined. Once all the ingredients are incorporated, pour the Nutella mixture over the crust in the pan and smooth into an even layer. Refrigerate the bars while you make the final chocolate icing layer. 6. Place the remaining ½ cup of chocolate chips or chopped chocolate, the remaining 4 tablespoons of butter, and the remaining 1 teaspoon of corn syrup in a microwave-safe bowl. Microwave until melted, stirring after every 30 seconds to prevent overheating. Stir or whisk the chocolate until it is smooth and glossy. 7. Pour the icing over the Nutella layer and smooth it evenly over the top. Refrigerate to set the layers, about 1 hour. Once set, remove the candy from the pan using the foil as handles, and cut into small squares to serve. Nutella Bars taste best when allowed to sit at room temperature for 10-15 minutes before serving. These bars do become very soft when exposed to hot temperatures, so it is best to store them in an airtight container in the refrigerator for up to one week.